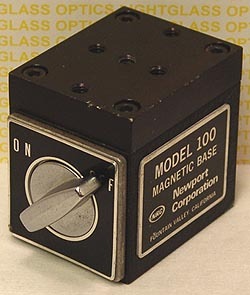 The Newport 100 Magnetic Base is now called the Newport MB-100. This base has an on/off magnetic control to allow positioning anywhere on your optical table. The top is drilled and tapped with 1/4-20 holes to accept optical accessories.